This past November, we attended a retreat at Warren Willis UM Camp called Imprint. 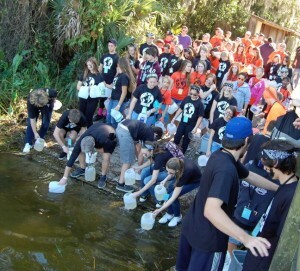 The retreat focused on health issues worldwide, including the issue of clean water. We participated in a water walk, in which we each carried two gallons about a mile to a lake, filled up the gallons, and walked back to camp. The water walk was pretty challenging, but what was really mind-blowing is that in Africa people walk on average four times the distance we did and walk at least 3 times a day. Through this water walk, our eyes were opened and we were inspired to make a difference. The Water Project is an incredible way to help bring clean water to people in need, and any donation to our fundraiser is greatly appreciated!